Street Gourmet LA: Happy National Taco Day: Here are the Best 25 Tacos in L.A. Happy National Taco Day: Here are the Best 25 Tacos in L.A. 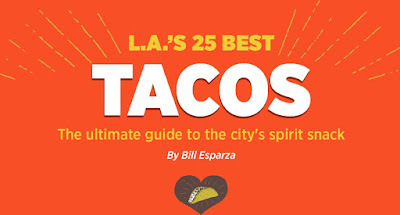 This is the only best taco list you'll ever need, the rankings aren't very important as I didn't really order them, but these are the best 25 tacos in L.A from Los Angeles Magazine's Taco issue. Enjoy and Happy National Taco Day!! !